Instead of focusing on one species this time, we want to share all of the exciting things that have happened with our zoology department this summer. Our zebra finches hatched four babies at the beginning of July; they are all very healthy and flying. The color patterns on the new babies are quite interesting as we have a leucistic female as the mother. All of the babies have some white feathers as opposed to the typical gray. The Madagascan Hissing Cockroaches also had babies. It was quite fun watching the live birth of these cool insects. The hissers are just one kind of insect that have live birth instead of laying eggs. They will be on display soon. Blue, our crayfish, molted his exoskeleton which looked like a second crayfish in the aquarium! The tarantula, Aragog, also shed. We knew it was coming because he stopped eating and began to make webs all over his terrarium. One afternoon, he was lying on his back getting ready to split his exoskeleton but it was late in the day, so we didn’t get to see him go through the process. We found the shed skin the next morning and Aragog was hungry and ready to eat. Redenbacher, our corn snake, has been more active now that she is in her new exhibit. She really seems to like the attention. Her past sheds are on display next to her terrarium for guests to touch as they go through the exhibit. All in all, it has been a great summer for the animals. Come out and see them before the cold winter months when everyone hunkers down and hides until spring! Although the name sounds ominous, these little frogs from Central and South America are quite incredible. Poison dart frogs, or arrow frogs, are small terrestrial frogs that live in the tropics of the Americas, spending most of their time on the ground or in low vegetation. They get their name from the use of their toxins by tribes living in those areas. The people of these tribes capture the frogs and rub their spears, darts, and arrows on the backs of the frogs to coat the tips of the weapons in the poison. Like many amphibious species, the skin of these frogs secrete toxins of various types that may cause illness, paralysis, or death in their prey and those that are unlucky enough to come into contact with them. However, in captivity these frogs are virtually harmless. Poison dart frogs bred in captivity do not carry the deadly toxins in their skin. The poison comes from the ants that the frogs eat in the wild. In captivity, the frogs are not eating these ants, and so the poison isn’t made and secreted. Even wild caught poison dart frogs will lose their toxicity over time. Sugar gliders are amazing little creatures. Suggies (pronounced SHU-geez), as they are lovingly called, are small, gliding marsupials from Australia. They are sometimes called flying squirrels, but they are not typically classified in that group according to classical taxonomy. They are in the same baramin, or created kind, as flying squirrels and they have similar genetic, morphological, and behavioral characteristics. 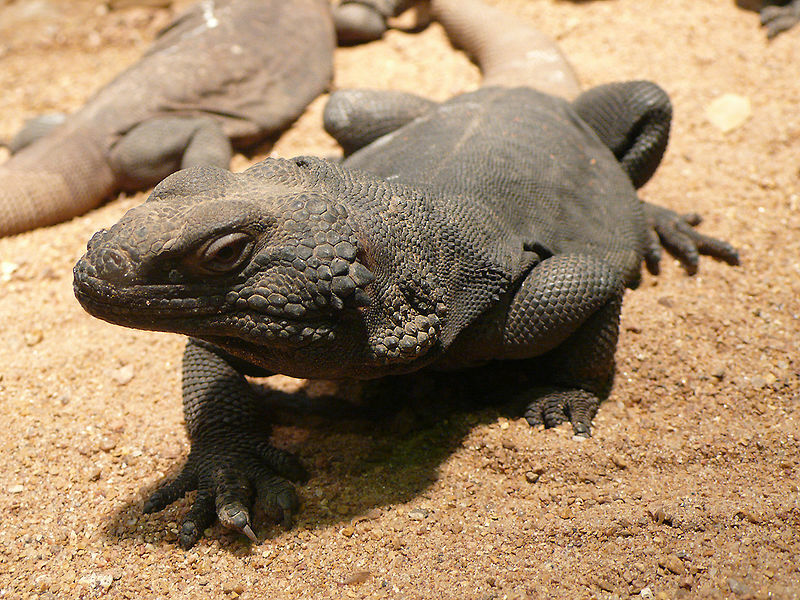 Suggies grow to be about 6 inches long, with a tail that extends another 4-5 inches. They are very soft and will cuddle if handled properly and often. Sugar gliders are very popular in the pet trade, but their care is rather controversial among breeders, owners, and veterinarians. No complete captive diet has yet been agreed upon. Akron Fossils currently has three suggies in the live animal collection. Sam, Jess, and Aloysius are quite fun to watch and play with. Sugar gliders are nocturnal, but can learn to flip their schedule somewhat so that they are awake during the day. Our sugars each have their favorite foods; Sam really likes her yogurt treats, Jess loves berries, and Aloysius gobbles down mealworms. Sam is pictured above eating one of her favorite treats. Sugar gliders are amazingly designed for their lifestyle. With their large, dark eyes they can see very well in the dark forests of Australia, Tasmania, Indonesia, and New Guinea. Their sharp teeth and claws are perfectly designed for chopping up insects and tearing into fruit and trees for the sap, which makes up the bulk of their diet. Suggies are rarely found near the ground in the wild as they are arboreal, meaning they spend their time in the tree tops. Their back legs are specifically designed to support the body weight as the gliders hang upside down and run up and down the tree trunks and branches. They will glide between trees with their legs fanned and the patagium stretched out. The patagium is the membrane attached to the front and back legs on each side of the body. In the cold season, when food is limited, suggies will undergo torpor, which is a type of short-term hibernation. Their body temperatures will drop and they will need to eat less. In captivity, they do not need to do this as adequate food is available. However, the gliders are susceptible to calcium deficiencies in captivity due to insufficient diets. This is why it is important that they have a proper diet and vitamins in captivity. Many times we have people ask us if sugar gliders make good pets. The answer is yes, but only if you are willing to fully care for them and provide for their every need. 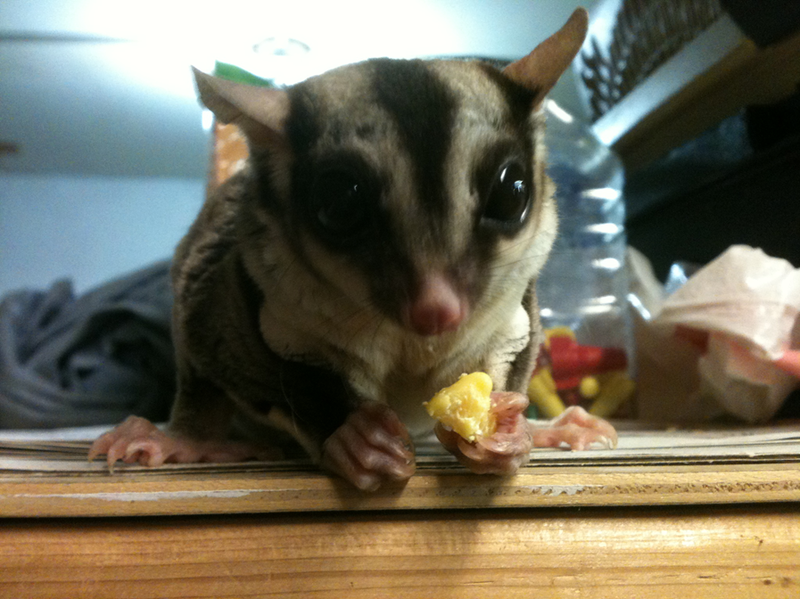 Come visit our sugar gliders at Akron Fossils to see these marvelous creatures up close! 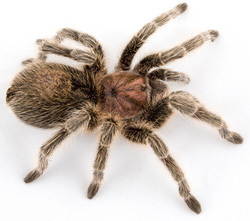 Habitat: The Chilean Rose-Haired Tarantula lives in South America in Chile, Bolivia, and Argentina. They live in the deserts of these countries and are nocturnal. These tarantulas, like many tarantula species, are solitary and live in burrows. Interesting facts: God has designed animals with special skills and characteristics for them to survive and thrive in their habitats. Chuckwallas live in the desert and will soak up the sunlight in the morning to heat up their bodies. Once they are warm enough, the skin on their backs turns from black to light brown or tan and reflects sunlight. These lizards are in no danger of overheating. Habitat: Moist hardwood forests across the eastern United States and Canada. 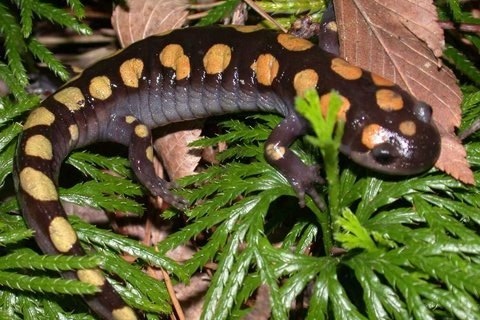 The spotted salamander is a mole salamander and is usually found underground or under logs and rocks.